BOARD REFRESHMENT Shearman & Sterling LLP 74 | Board Refreshment NON-INDEPENDENT DIRECTORS of the Top 100 Companies have boards composed of 75% or more independent directors. 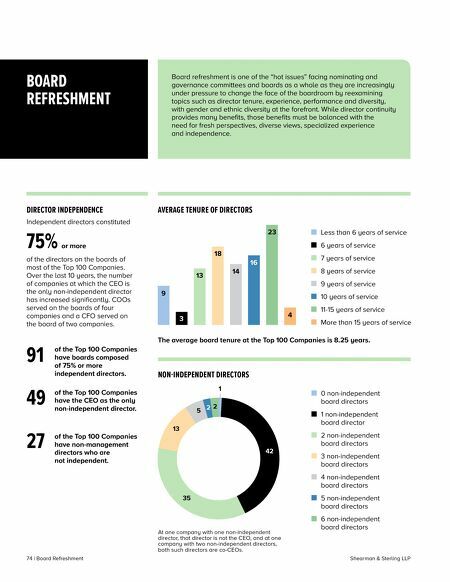 91 of the Top 100 Companies have the CEO as the only non-independent director. 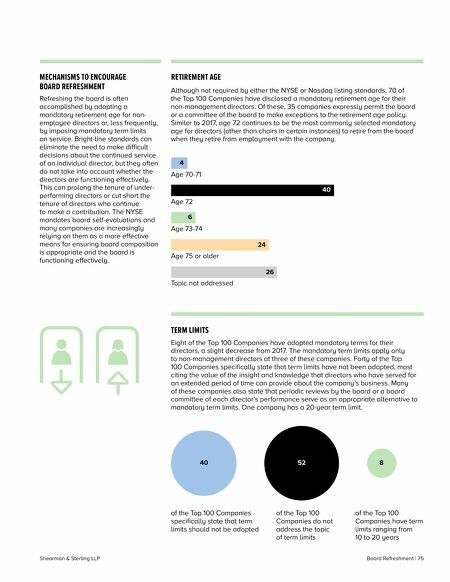 49 of the Top 100 Companies have non-management directors who are not independent. 27 42 35 2 2 1 5 13 0 non-independent board directors 1 non-independent board director 2 non-independent board directors 3 non-independent board directors 4 non-independent board directors 5 non-independent board directors 6 non-independent board directors Less than 6 years of service 6 years of service 7 years of service 8 years of service 9 years of service 10 years of service 11-15 years of service More than 15 years of service AVERAGE TENURE OF DIRECTORS DIRECTOR INDEPENDENCE Independent directors constituted At one company with one non-independent director, that director is not the CEO, and at one company with two non-independent directors, both such directors are co-CEOs. BOARD REFRESHMENT Board refreshment is one of the "hot issues" facing nominating and governance committees and boards as a whole as they are increasingly under pressure to change the face of the boardroom by reexamining topics such as director tenure, experience, performance and diversity, with gender and ethnic diversity at the forefront. While director continuity provides many benefits, those benefits must be balanced with the need for fresh perspectives, diverse views, specialized experience and independence. The average board tenure at the Top 100 Companies is 8.25 years. 3 13 18 14 16 23 4 9 75% or more of the directors on the boards of most of the Top 100 Companies. Over the last 10 years, the number of companies at which the CEO is the only non-independent director has increased significantly. COOs served on the boards of four companies and a CFO served on the board of two companies.